It’s not surprising that office workers are 20% more productive when information is visually displayed. Agile methods such as Kanban help teams to cope with the unexpected by allowing teams to visualize work, teams can then prioritize and adjust plans quickly and effectively. 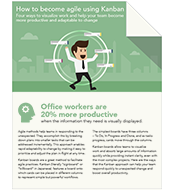 Find out how Kanban can benefit your team.